NOW three years into their five year mission to seek out new life and new civilisations, the crew of the star ship Enterprise are beginning to feel the fatigue that a five year mission in space will have on a soul. Captain James T Kirk (Chris Pine) is pondering where exactly his career is headed, Commander Spock (Zachary Quinto) is taking a bit of a break from his relationship with Communications Officer Uhura (Zoe Saldana), Sulu (John Cho) is briefly reunited with his family, while Scotty (Simon Pegg) and Doctor Bones McCoy (Karl Urban) are just happy to get on with things. I HAVE to admit, I’m a big Star Trek fan, so the release of Star Trek Beyond had the same affect on me as The Force Awakens did on the average Star Wars fan. For me, the recent reboot of the Star Trek franchise has gone from strength to strength since JJ Abram’s fabulous Star Trek in 2009. Although the last movie, Into Darkness, received a lukewarm reception from most critics, I still enjoyed it for what it was. Now with a new director on board in the form of Justin Lin, who is well used to directing fast-paced action set-pieces with his work on The Fast and The Furious movies, Star Trek Beyond is a slick, entertaining and hugely fun slice of sci-fi that pushes all the right buttons in terms of action, drama and pathos. Dedicated to the late Leonard Nimoy and Anton Yelchin, the young actor who played Chekov and who recently lost his life in a tragic accident, for all onscreen fun and frolics, Star Trek Beyond has moments of emotional gravity and, Lin expertly juggles the mixture of emotional plight and rip-roaring action. 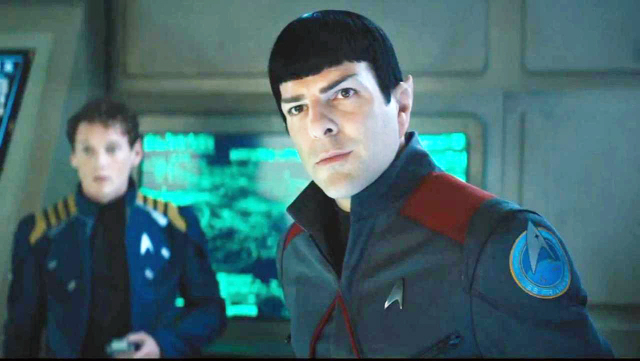 As in the previous movies, the cast are all on top form, Chris Pine embodies the very essence of a younger and more dashing William Shatner, Zachary Quinto does the late, great Leonard Nimoy proud and, the superb Idris Elba makes for a gloriously demented baddie. ANOTHER fantastic instalment in the Star Trek franchise, Star Trek Beyond will provide a thrilling night’s entertainment at the flicks!